I recently splurged and grabbed myself the full set of Bow polish thermal top coats. I had previous received the black one for review and decided I needed the full set. 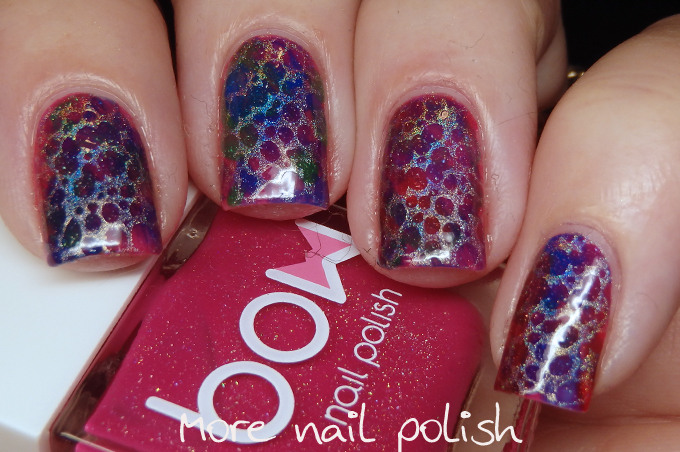 I was lured in after seeing amazing mani's by Anna Goralova and Sveta Sanders. I'm so glad I got them because they are so fun to wear and give me endless amusement. These polishes seem to really match my own thermal dynamics, because often during the day my nails would switch between the full warm look to the full cold look, and obviously various stages in between. Maybe that's because it's winter here, so going inside and outside would make a significant difference. These polishes also never cease to amaze my colleagues at work, who often notice that my nails have changed colour before their eyes. These top coats are nicely pigmented in their cold state and in their warm state they are nearly opaque too, but a neutral opaque with just the slightest tint. The pink one would be the best in terms of going to a completely invisible colour when cold, the purple, blue and green ones still have the slightest tint when cold. For this mani I did random swipes of all the colours over my nails. It was really hard to tell what the final look was going to be like because when I painted my nails my fingers were warm. Therefore the colour just kept disappearing to an opaque white as I painted it on. 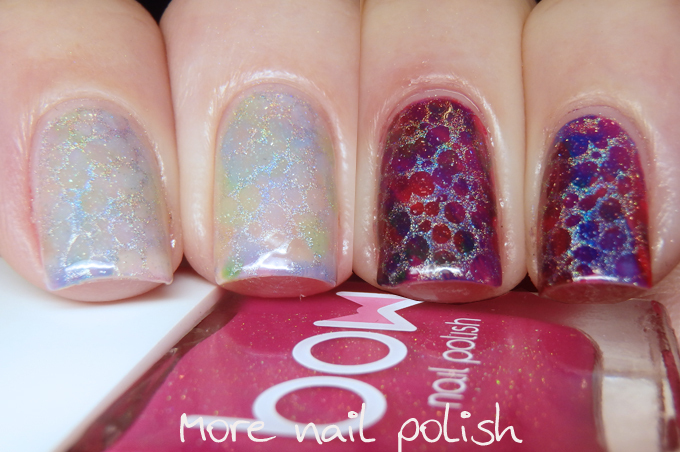 Next I stamped a bubble pattern using Dance Legend T1000, which is a silver holo. 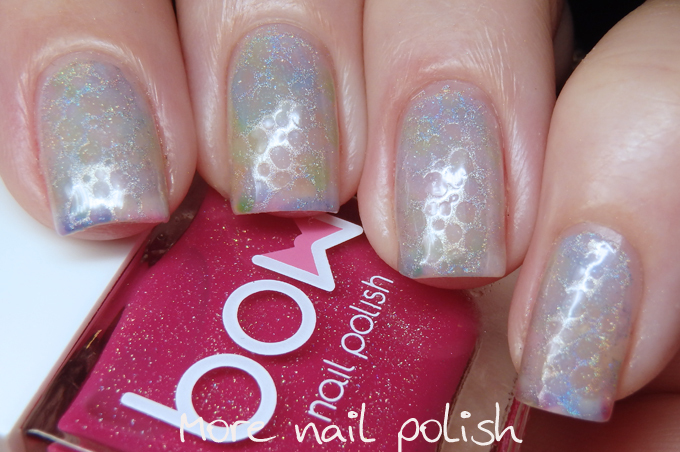 This just gave it an extra bit of sparkle, even though the Bow thermal top coats also have a nice sprinkling of scattered holo. It's pretty obvious to tell which is the cold version and which is the warm. This first photo is actually two photos cut together down the middle two fingers. 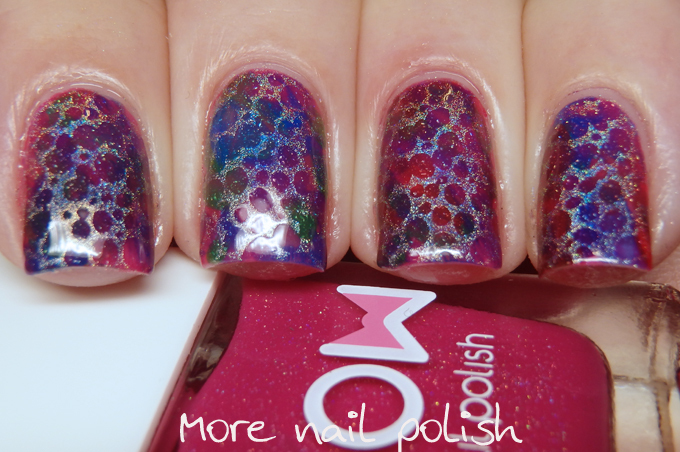 I have so many ideas for these manis, so be prepared to see me still getting excited by thermals. WAIT... WHAT??? WHERE DO WE GET THESE MAGICAL WITCHCRAFT THINGS?? What a magnificent colour change! 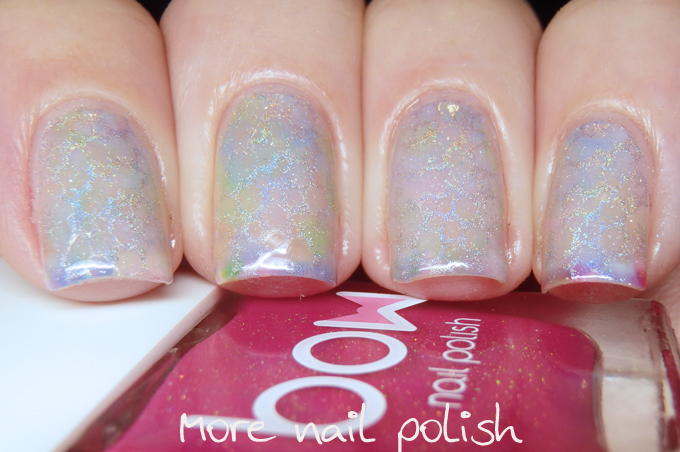 I have one of this polishes and I want more!